Updates and information from September 2017! 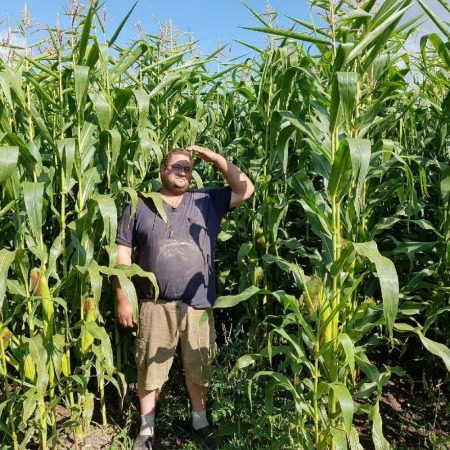 Danny our Crop Manager is very proud and pleased with our corn silage crop. The corn still needs to mature more, so he is a little worried about an early frost though. Thanks to everyone who dropped by our booth this week (Sept 12-14) at the Outdoor Farm Show near Woodstock! 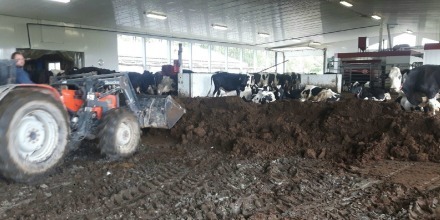 In the main barn, our cows enjoy the compost pack. It consists largely of sawdust and manure from the cows. The pack is full of aerobic bacteria that eat everything - including ammonia and carbon - and help breakdown the sawdust and manure in the pack. For this reason there is hardly any smell in the barn. Today (September 8th) we're cleaning most of it out to be placed on the fields - all 300,000 kg of it! In the soil, the little critters will continue to chew on it and benefit from it. To rebuild the pack for the cows, sawdust will be spread, and part of the old pack will be mixed in as an inoculant to help the process start anew. Two beautiful new arrivals on September 7th. Grover had twin girls. Please welcome Cookie and Sesame! These are a few of our barn cats enjoying breakfast about 6am on September 6th. 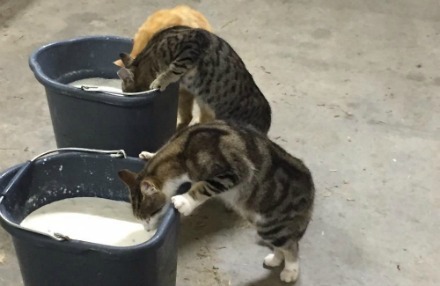 The cats have an important role to play on the farm. They catch mice and rats, clean up spilled milk and of course our visitors love them. If you visit the farm, it can be hard to see our barn cats. They tend to vanish into the attic after breakfast. Arwa is pretty sure they have a palace built up there with chaise chairs, velvet drapes and the whole works. Cows do not have teeth at the top but do have molars top and bottom. When they graze they wrap their tongue around the grass, lift up their head, and cut the grass. That is why they have such strong necks. The motion is a bit subtle in the video here, but you can see the cow pulling back or away as it eats. The molars are mainly used to chew their cud when they bring their feed back up from their rumen to mix it with saliva (about 100 litres per day). 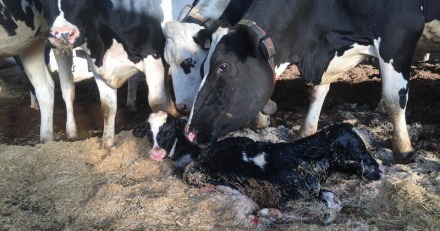 Given the opportunity, cows will sort their feed which you can see happening in the video below. They will pick out the pieces they like most like grain. We do not like that. Every bite should be the same in order to get maximum benefit. Unfortunately, this piece of equipment is quite expensive, but hopefully in the future we will add one to our farm.